Femoral nerve damage causes severe pain in the upper anterior thigh. This page was updated by Dr Barrie Lewis on 29th October, 2018. Most folk have heard of sciatica, and the nerve which comes from the lower lumbar spine. It supplies the back of the thigh, side of the lower leg and much of the foot. However, the femoral nerve is a lesser known, but equally serious source of pain, affecting mainly the lateral buttock, the side and front of the thigh, the medial knee and the inner lower leg. And because it innervates the quadriceps muscle, which becomes extremely painful when the nerve is irritated, and sensitive to pressure, it may cause the knee to give when climbing stairs and even walking. A marked limp thus often characterizes people with femoral nerve damage. A 65 year old man, normally very active, six weeks ago, bent over, twisted to the left and pulled a very heavy object. One hundred and twenty kilos, which was very silly. Later in the day, pain began in the mid lower back radiating to the lateral buttock and the side of the thigh. In short, lower back and leg pain which is often worse at night. There were no sensory or motor signs; a grade 2 lumbar disc protrusion; sometimes called a prolapse, though I reserve this term for more serious damage to the disc. This is usually a routine condition, seen frequently in chiropractic help clinics. So, why a webpage on what's routine? Read on. Femoral nerve damage often causes weakness of the quadriceps muscle and a marked limp. Bending forwards became very stiff, but did not provoke the leg pain. Neither did extension or sideways bending. He reported that two months previously he had a similar attack of lateral thigh pain which past spontaneously with anti inflammatory drugs after two days which he, wrongly, associated with an attack of gout which he was also suffering from at that time. He attended a local chiropractor who adjusted his lumbar 3 vertebra, assuming a central lesion, several times over the course of a week, and the pain and disability was greatly relieved. Assuming all was well, forgetting the 50 percent less pain rule, he returned to building a staircase. Silly man, he ought to have known better! The pain of virtually all conditions subsides much faster than they heal. The neurology of the Femoral nerve is extremely complicated. For simplicity, since this is not a lesson in neurology, but one in Chiropractic Help. Let's simply say that the L4 nerve root, for example, is most commonly affected by a central L3-L4 disc, but the nerve root emerges from between the L4-L5 vertebrae. 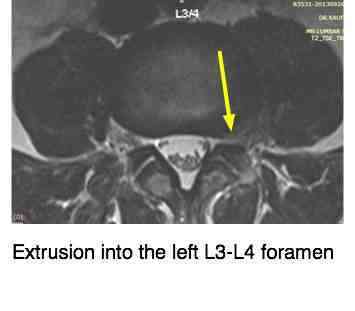 It is here, between L4-L5 in the IVF that a far lateral extrusion may compress the L4 nerve root. Obviously this makes for confusion, be it the chiropractor who is wondering whether to adjust L3 or L4, but also for surgeon - at which level must he enter? Sometimes, the consulting physician might be lucky and the patient stands in an "antalgic' posture, leaning like the Tower of Pisa. 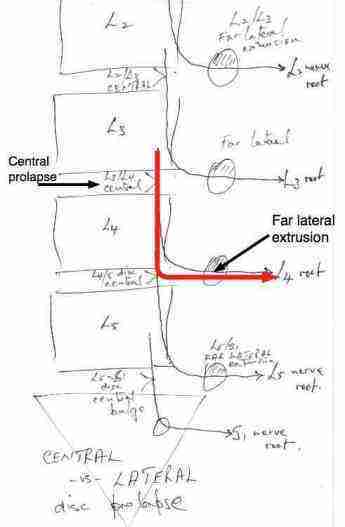 Towards the painful side means a central (medial) lesion, whereas away from the painful side means a lateral lesion. Our patient was not antalgic. 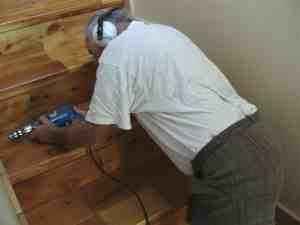 Forgetting the 50 percent less pain rule he then began cutting and fitting the skirting to a new staircase. Whilst lying on his right side, again twisting to the left, and applying pressure to drill into the concrete, he felt the disc "pop" with immediate pain in the left mid lower back. Foolishly he drilled three more holes to complete the task. Within an hour he had severe pain in the left buttock, side of the upper leg pain and a numb feeling just below the knee. There was minimal back pain, just a very stiff and restricted feeling. No back pain + severe leg pain = Grade V extruded disc. An "inter vertebral disc" consists of two parts, an outer washer called the annulus fibrosis, and an inner gel called the nucleus pulposis. Lower back pain... to lower back and leg pain ... to mainly leg pain. 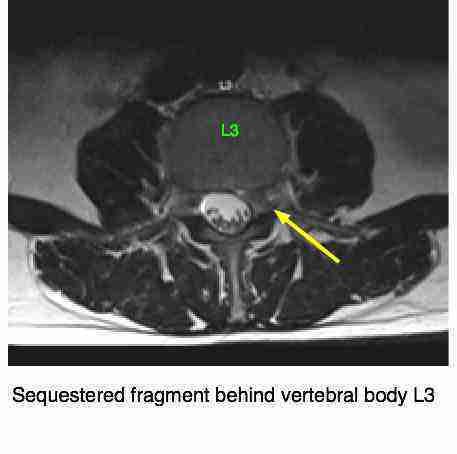 What was unusual in this case was that the sequestrum migrated upwards from the L3 L4 disc, seen behind the L3 vertebral body. It happens sometimes, as will be clearly seen on scans further down. Returning to his chiropractor, she expressed doubts. 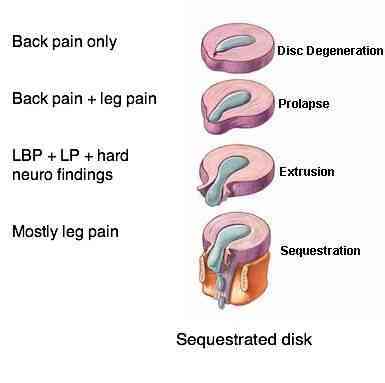 It was most unlikely that chiropractic could successfully treat a sequestered disc. The Femoral nerve damage was severe, which he could attest to. Nasty buttock and upper leg pain. On examination, there were definite sensory changes in the L4 dermatome, with a large numb patch just below and medial to the knee. Worse, the knee jerk reflex was completely absent, even with reinforcement, and there was weakness in the left quadriceps muscles. he confirmed the knee was tending to give on those stairs he had been building. The Gluteus minimus muscle, L4 L5 S1, and Vastus Lateralis muscle became extremely painful, as happens when a muscle is denervated. A deep inescapable ache, especially at night. Frank chiropractic manipulation, with a release, seemed to increase the pain in the leg. Instead, his chiropractor began to give what she calls a roll-drop: gentle side-posture treatment, with a drop, but with insufficient force to gain an audible release. Or, only a small release from the facet joint. There was gradual improvement, but with setbacks until he realised that going into even the slightest extension, aggravated the problem. So gentle, careful, cutting of bamboo, because of that extension, was forbidden. As was reaching up to pick lemons... again extension. Neither were painful at the time, but later the leg pain was clearly exacerbated. On one occasion, on a particularly good day, just the range of motion examination, by putting the spine into extension caused extreme pain in the leg for the rest of the day. Conclusion: Still on anti inflammatory drugs every night to enable him to sleep, still much pain on sitting, not much progress over the last two weeks. He was still working part-time. The decision to have an MR scan to see exactly what was happening was made. A consult with a neurosurgeon was looming... he was walking with a marked limp, and still in quite extreme pain in buttock and lateral thigh, and vague numb, tingly feeling in the lower leg just below the inner knee. The L4 dermatome. At the mid L3 level a soft tissue mass lies in the left side of the spinal canal anteriorly. 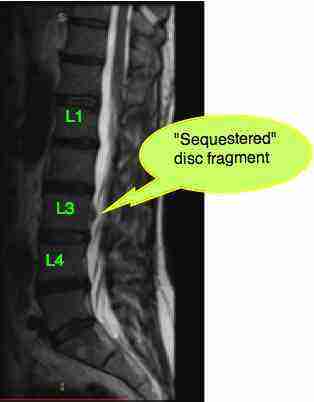 This respresents a sequestered disc fragment. The L3-L4 disc shows extrusion into the left foramen and laterally with loss of foraminal fat. Severe compression, displacement and oedema of the emerging left L3 nerve in the foramen. This sequestered disc fragment can be seen, just to the left of the yellow arrowhead above, distorting the thecal sac that encloses the spinal cord. It's possible that this could also affect the nerve root from above, L4, or was it a far lateral disc herniation compressing the L3 nerve root and causing the excruciating, burning buttock pain, and lateral leg pain? The neurology is not what's important. There is severe buttock pain, and clear evidence of L4 radiation down the inner lower leg. Notice here the confusion: The mri suggests there is a far lateral extrusion at L3 L4, and the patient should jolly well have L3 radiating pain! But he doesn't. He has L4 radiating pain. Is it any wonder that so called failed back surgery is such a significant phenomen? Even more difficult for the chiropractor who has to work this out, without the aid of an mri. It's for this reason, that a group of the world's top lower back specialists concluded that they were right less than 50% of the time in making the correct diagnosis of lower back pain. 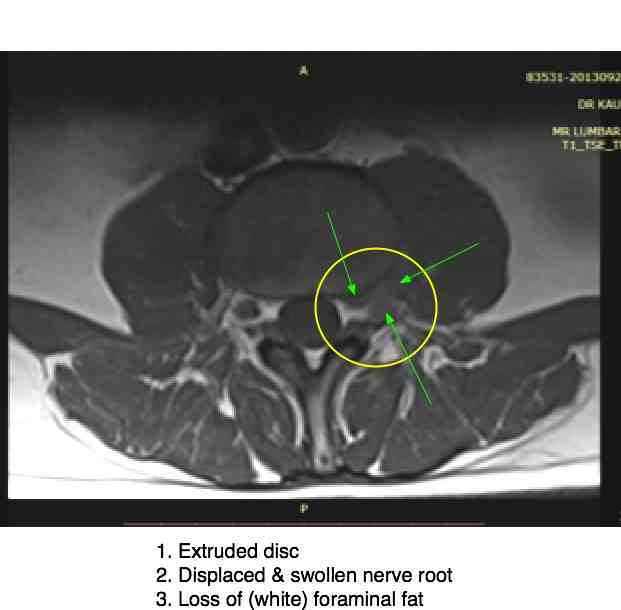 The scan clearly points to the lumbar 3 nerve root in the foramen between the lumbar 3 and lumbar 4 vertebrae, an intraforaminal extrusion displacing the lumbar 3 nerve root causing the weakness of the quadriceps muscle and distal knee severe sensory changes. An interesting aside when considering what appears to be hip and knee conditions; In an interesting research article reported in Surg Neuro, July 2009, researchers report that in 17 consecutive midlumbar radiculopathies, because of the radiation to hip and knee, four of the seventeen, almost a quarter, were misdiagnosed with hip and or knee pathology. Compare the inter vertebral foramina. Note the quite different appearance of the left IVF on your reading RIGHT as compared to its mate on the right. 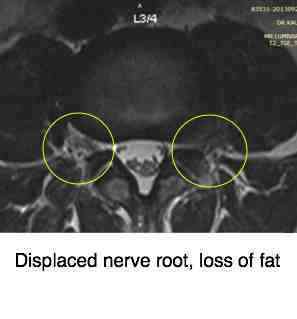 The three features of the radiologist's report are clearly seen: extrusion, displacement of the L3 nerve root, and loss of the (white) fatty tissue that normally fills the foramen. The typical signs of Femoral nerve damage. Willy nilly, our patient has finally accepted the seriousness of his condition. Garden and carpentry shop are banned and he is having the gentle treatments noted above, not sitting at all, not bending, and spending considerable time on his back. Follow my own slipped disc rules was paramount. Seeing the mri explained why extension increased the pain in the leg, with the trapped nerve root caught in a pincer movement between the facets on extension. Still doubts over which nerve is affected: lumbar 3 or lumbar 4? Two swims per day, water temperature 60 fahrenheit, and two short walks are part of the regimen, and proving very beneficial. Whether the cold, or the exercise, there is almost no pain after swimming. He is now off all painkillers and anti inflammatories. There is no disturbance of sleep. There is periodic pain in the buttock and lateral leg lasting in the main a few seconds only. The sensory disturbance and weakness of the quad continue, but walking on the stairs is slightly better. Perhaps wishful thinking. On average, the pain is perhaps 80 to 90% better. Since there has not been much back pain, disability has not been a major feature of the disease. Turning in bed, dressing, have not been limited. A deep seated weak feeling remains in the lower back. The 50 percent less pain rule remains clearly in his mind, the dangerous time. He can't afford another setback, that would be an own goal! Who is this 65 year old twit? You've got it figure, haven't you. It is I. And the superb chiropractor treating me, with great patience, is my daughter, Dr Jane Ackerman. Slipped disc rules should be followed rigorously by those who wish to escape the knife; femoral nerve damage is very serious. Never assume that it's only other people who get seriously ill, have to go under the knife; take every back injury seriously. Chiropractors who break the 50 percent less pain rule are just as likely to seriously injure their spines, just as doctors who break the medical rules do.Following my own slipped disc rules was a vital part of the healing. This is not an exercise in self-abasement but an opportunity for you, if you are suffering from lower back and leg pain, to gain understanding what is involved in getting better. No pain in the back or leg last night or today. No medication. A deep sense of weakness in the back remains, and the strength of the left quadriceps muscle is certainly not normal. Update: Improvement continues, with the back feeling much stronger, but any over exertion is immediately rewarded with a numb tingling feeling in the lower leg. I have had 15 treatments from my chiropractor. Normally that would be a considerable sum of money. In the region of $500 to 700 or even more. I have spent a large part of the the last two weeks on my back, working on the laptop, sitting hardly at all, and not once in the car, except to go for the scan. You may say: I can't afford that amount of money, and I certainly can't afford to take 2 to 3 weeks off from work. And what guarantee can you give me that Chiropractic can repair my extruded disc? The answer is no guarantee can be given. But can your surgeon? Ever hear of FBS? Failed Back Surgery. Go ask the price of hospitalisation + anaethestist + surgeon. You'll be astonished. And finally, ask the surgeon: how soon can I return to sitting, the car and a full day's work? Less than a month? Having seen the scan, the good man was something of a Doubting Thomas. He reckoned surgery was imminent. But, said he: "If you can sweat it out, your back will be FAR better than after surgery." "Thank you, sir. Here I am virtually painfree six weeks after the initial injury, five weeks after the full extrusion of the disc into the foramen." I now have a gentle treatment about once a month, gentle, with no audible releases. There is no leg pain, but occasionally an odd tingle in the thigh. No numbness. The strength is certainly returning to the thigh muscle, though it's not quite normal. Suddenly, this week, gout in the foot again, damn it hurts! slight pain in the fingers and slightly increased lower back pain. Too much red meat over Christmas, and now paying for it. It's always good to keep the old adage in mind: the patient can have more than one disease, in this instance gout and femoral nerve damage. I'm back gardening, carpentry, treating patients as normal, but mindful of where I was four months ago. You don't mess with severe Femoral Nerve Damage. Whilst digging potatoes this week, I was wary! What a reward, I was like a small boy on an Easter egg hunt. 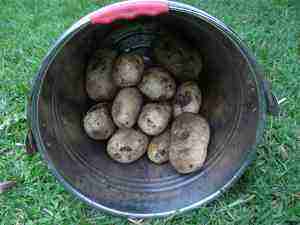 Just from one plant, 13 spuds. That's the power of making your own compost pile. Just type "compost pile" into the search function below. I have been exceptionally lucky; over and above the chiropractic treatment, intermittent bed rest and a faithfully done lower back exercise regimen, I added anti inflammatory foods to my diet. 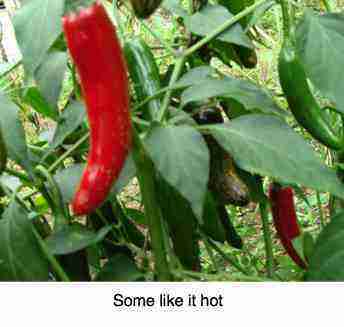 Pilchards three times a week, freshly ground flax seed in the low GI bread I make most days and anti inflammatory chili every day from the garden; a jalapeno a day has done the trick. I have zero pain or disability, no weakness in the leg, but a very slight numb patch on the inner knee, only noticable when I rub it. I can report that 5 years later all is still well with this femoral nerve damage; I still do my exercises faithfully, recognise that there are limits to heavy lifting, and still need an occasional chiropractic treatment. But I am able to lift heavy beehives, turn compost heaps and do heavy gardening. The one activity that always brings on a warning is using a hoe which involves bending and twisting to the left, the cause of the original injury. Lower back and leg pain is the most common complaint at the chiropractic coalface; more usually it's a sciatica, but femoral nerve damage is not uncommon. The sciatic nerve from the lower lumbar spine is more commonly affected in the younger person; Help for sciatica pain is a daily business in every chiropractic office. But in the older person, the femoral nerve is more likely to be affected. That means upper leg pain and inner lower leg pain, and often a weak quadriceps muscle. Chiropractic help is no magical formula for lower back and leg pain, and particularly if there is femoral nerve damage. Each case has to be carefully and thoroughly examined and properly managed. A period of bed rest, coupled with ice and back exercises every half an hour is, in my book, often part of the regimen, though it's controversial. Research shows that bedrest with no other treatment does not help back and leg pain. The hardest part is that the patient has to stop. That means less sitting, often taking several weeks or a month off work, and not jumping back in the deep end once the pain has lessened. There's a large hole in the annulus fibrosis and it has to be given time to heal once the pain has gone; otherwise it pops again. Severe Knee and upper thigh/groin pain when sitting/driving for more than 30 min - Linda.